What else makes for “strange rains”? Take a look at the photo above. The photographer identifies the slopes of Sochi, Russia, with the caption “Mars attacks!” What material made the Eastern European snowfall an otherworldly orange? dust. Dust storms in North Africa threw tons of sand, dust, and pollen into the atmosphere. Winds in both the lower and upper atmosphere carried these specks of dust across land (Africa and Europe) and sea (Mediterranean and Black). 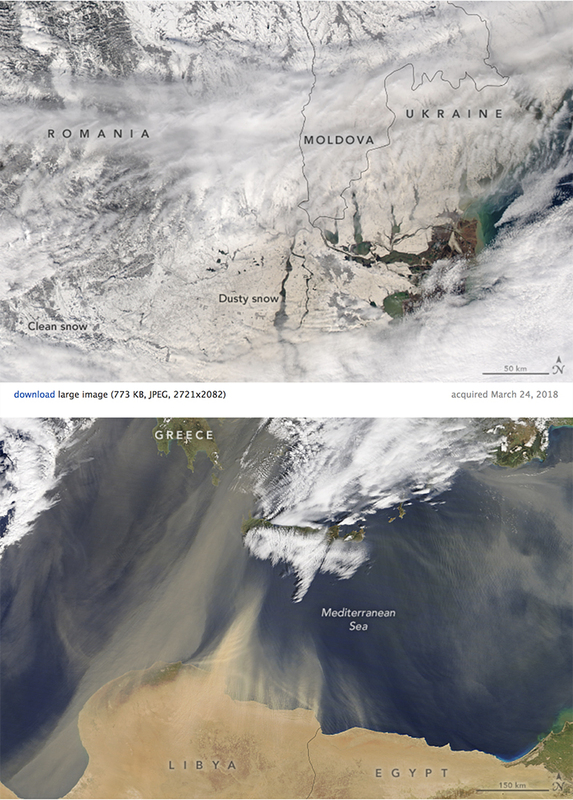 The dust first blew across the Mediterranean, where it reduced visibility across islands such as Crete and Cyprus. As winds carried the dust plume to the northeast, it mixed with cloud cover over the Black Sea. (Take a look at the orange line of Saharan dust in this beautiful image from NASA’s MODIS satellite.) Here, these particles of sand, dust, and pollen became cloud condensation nuclei (CCN)—microscopic bits of matter around which water vapor condenses. These orangey CCNs, surrounded by water, became raindrops and snowflakes. Take a look at our map of prevailing wind patterns around the globe. What is the name of the prevailing winds that transported all that dust from the Sahara to the Black Sea? westerlies. Westerlies, sometimes called anti-trade winds, are the powerful prevailing winds moving from the west-to-east in the mid-latitudes (between 30 and 60 degrees) of both the Northern and Southern Hemispheres. Is the orange snow dangerous? Not really. Skiers in the Black Sea resort town at Sochi, Russia, continued to enjoy the slopes. However, scientists are always studying precipitation for traces of microbes, such as bacteria, fungi, and viruses. Organisms from one area (where the dust originated) could possibly impact organisms and ecosystems of another (where the dust settled). Learn more about that here. Before mixing with clouds in the upper atmosphere over the Black Sea, Saharan dust did post a risk to Mediterranean islanders. People with respiratory ailments, children, and elderly residents across the eastern Greek islands were advised to stay indoors as much as possible, as the dust posed some hazard to breathing. How far can airborne particles travel? In 2010, the eruption of the Icelandic volcano Eyjafjallajokull reduced visibility and incapacitated airports across Europe. Take a look at the amazing animation here. Sahara dust storms regularly cross the Atlantic to fertilize Amazon rain forests. Take a look at our great resource on that process here. In 2016, Saharan dust brought hazy skies to the coastline of Texas.